The supermotard from Aprilia evolves with the sole objective of providing maximum riding fun. 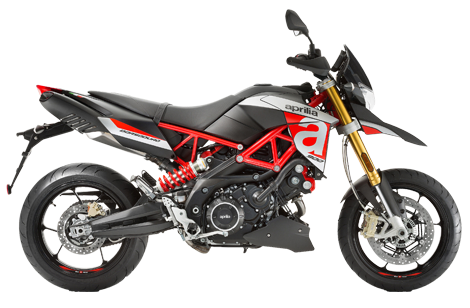 Dorsoduro 900 is born out of Aprilia's solid tradition in this motorcycle segment and it is a true thrill generator. A revamped twin-cylinder with 90 nm of torque combined with bar-setting chassis architecture enhances its distinctive characteristic as a fun bike. Full multimap ride-by-wire, traction control and ABS round out a technical package par excellence. Aprilia Dorsoduro is the fun bike par excellence. Born out of an ingenious intuition by Aprilia, it was built with the sole objective of providing the most possible road riding fun, drawing from the best characteristics of sport bikes and supermotards. *Finance from BMW Financial Services (a division of BMW Australia Finance Ltd, Australian credit licence 392387) on a consumer loan at 7.29% pa. On a ride away price of $14,590.00 and no optional extras with 60 monthly repayments of $303.08 and a final payment of $303.08. Total amount payable is $18,184.80. No other offers apply. Fleet, government & rental buyers excluded. Fees, charges, terms, conditions & approval criteria apply. Offer applies at Brisans Motorcycles while stocks last on new motorcycles. Offer valid as of 20/04/2019. ^Comparison rate based on monthly repayments for a 5 year secured consumer loan of $30,000. WARNING: This comparison rate is true only for the example given & may not include all fees & charges. Different terms, fees or other loan amounts might result in a different comparison rate. Enquire now with one of our business managers for further details on 02 4940 8777.